Looking for an escape from the cold this winter? 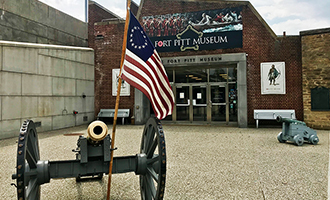 Venture through Point State Park to the Fort Pitt Museum for a walk through Pittsburgh history in two floors and 12,000 square feet of exhibits. There’s a lot to see, so we picked the top five artifacts you can’t miss on your next visit to the museum. Take a look! The diorama resides behind the admissions desk on the first floor of the museum. To become acquainted with the orientation of Fort Pitt at the Point. Ever wonder why Point State Park has outlines sporadically laid out on the ground throughout the park? Look to the model of Fort Pitt to understand what those lines represent. The outlines show where the fort sat during the French and Indian War. 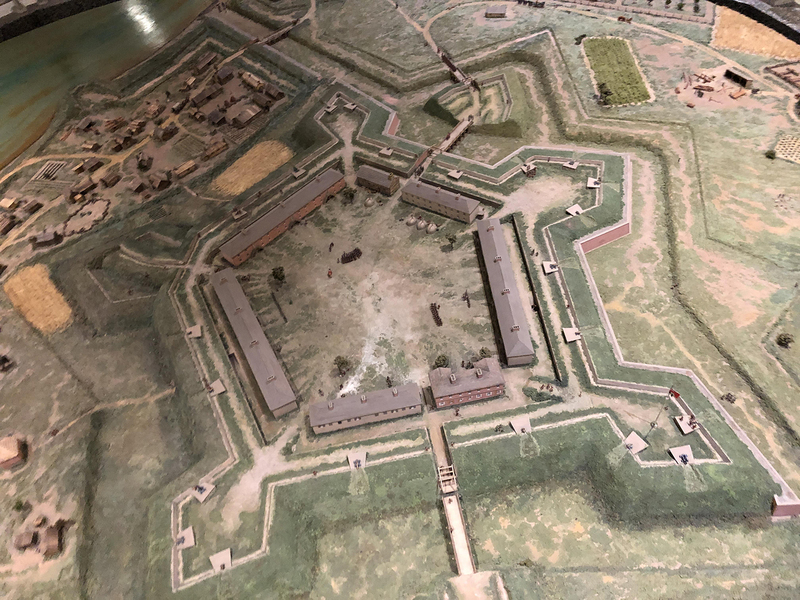 As you begin your visit at the Fort Pitt Museum, let your eyes wander through the model of Fort Pitt and think about what an average soldier’s or townsperson’s life would have consisted of each day at the Point. You will notice the main fortification that made up Fort Pitt as well as the King’s Gardens, complete with townspeople playing nine pins and deer frolicking in their pens. Once you pay admission, make your way to the exhibit space located in the back of the first floor. Walk toward the brick walls and begin exploring. To learn about the variety of artillery and ammunition that a cannon can fire. Visitors love to check out the cannons on display at the museum, but what goes inside the cannons deserves a attention as well! Take a moment to examine the artillery laboratory in the fort’s casemate. Fort Pitt contained seven casemates, which are underground areas within the fort’s ramparts, during its time of operation. Three of them acted as provision storage, and the other four spilt the roles of artillery supply storage and laboratories. 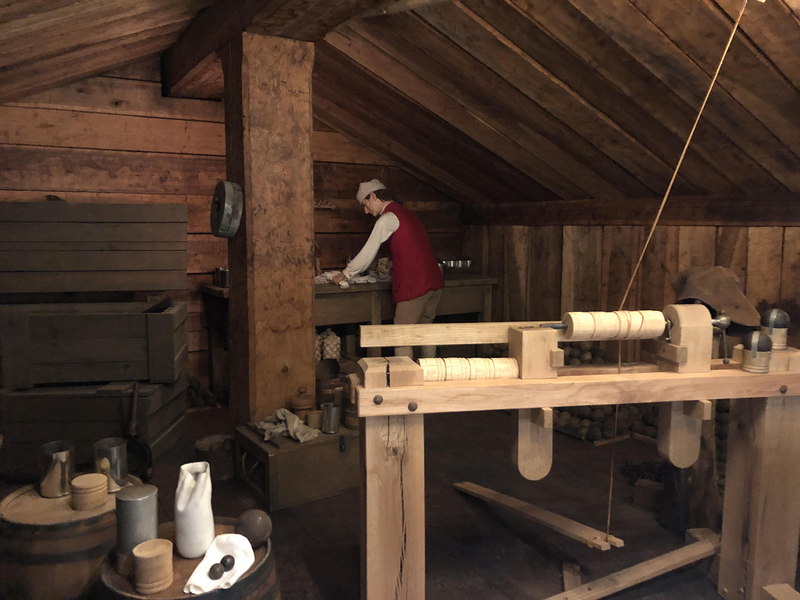 The laboratories served as the main workshop to construct the ammunition supplies, flannel cartridges, fuses, grapeshot, case shot, grenades, and shells that aided in protecting the fort. Try to find the different types of ammunition in the exhibit. Travel up to the second floor to find these reproduction belts in the case near the puzzles. 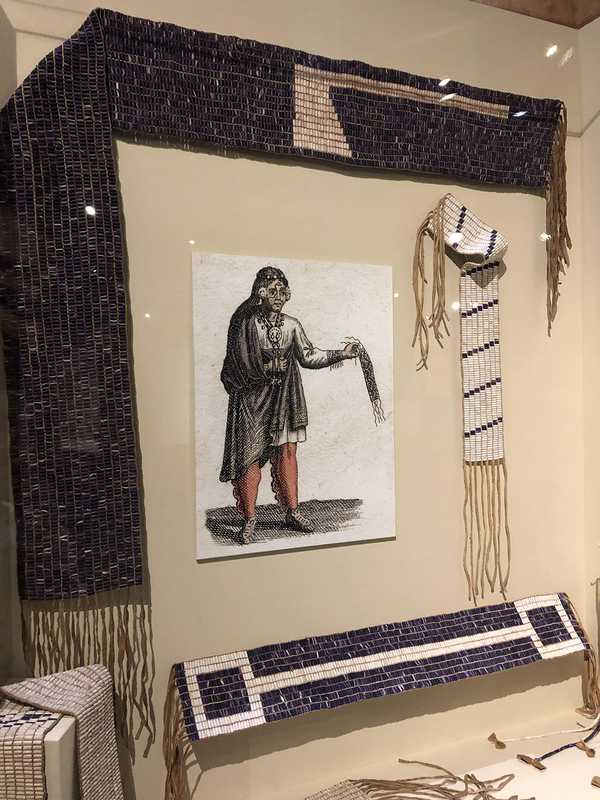 To discover how the belts documented important events, stories, wars, and agreements between American Indian nations and their friends and adversaries. Depending on the images woven into the belts, they could proclaim war or peace, record historically important events, or act as legal documents. Though not considered to be money, the individual beads from the belts were trade items. The patterns on the belts consist of purple and white beads, the color resulting from the shells used to make the beads. Purple represents a message of political importance and white symbolizes peace. Attempt to translate one of the belts to figure out what message it is relaying to the receiver. After watching the short video on Western Pennsylvania’s involvement in the Revolutionary War, learn about the Whiskey Rebellion in the same gallery space on the second floor. To discover the taxing history behind this artifact. 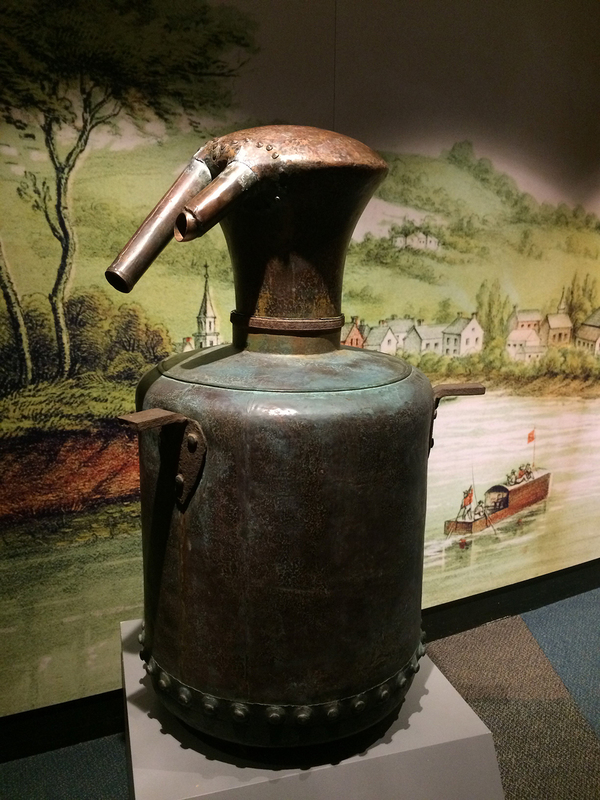 The still on display correlates to the Whiskey Rebellion, a 1794 uprising over the taxation of whiskey that financially hurt smaller distilleries west of the Allegheny Mountains. In hopes of alleviating some of the states’ massive debts from the Revolutionary War, George Washington, following the suggestion of Alexander Hamilton, approved a congressional tax on whiskey. Larger distilleries did not mind the tax because their profits remained high enough to see minimal loses. The smaller distillers, however, did not fare as well and resorted to violence against the tax collectors and those who complied with the tax. The still on display exemplifies an 18th-century European style and is only one of a handful of copper stills still in existence. Pick a side. Would you have been for or against the whiskey tax in the late 1700s? Find this artifact on the second floor near the two mannequins, a man and a woman holding a baby, discussing their family’s future. To see an inkstand used to document important happenings at Fort Pitt by a relation of Benjamin Franklin. 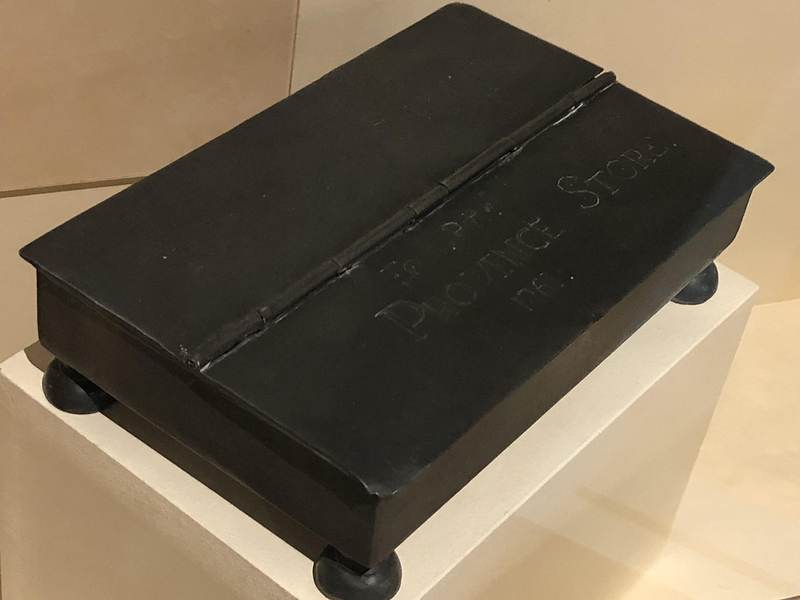 From 1761 to 1765, Josiah Franklin Davenport, nephew to Benjamin Franklin, used this inkstand while managing the Pennsylvania provincial trading post at the town of Pittsburgh and at Fort Pitt. During his time at Fort Pitt, Davenport witnessed the return of American Indian captives from the Ohio country. Historians speculate that Davenport wrote down the names of these returnees with the inkstand on display. Would you want to switch careers with Davenport or perhaps exchange relatives? Mariah Simensky is the event & visitor services coordinator at the Fort Pitt Museum.